Thanks to our friends at the Western Neighborhoods Project for permission to reprint this article. Midtown Terrace has long held a fascination for me. Growing up in the Inner Sunset, I had come to know the neighborhoods of San Francisco to be old, established, and in some cases even a bit run-down. It wasn't until I was 12, that I discovered the gem of a neighborhood known as Midtown Terrace. I discovered it because I had a crush on a girl who lived there. It defied everything I thought I knew about urban San Francisco. In fact, I found it to be a virtual suburban utopia located in the exact geographic center of the city. Twin Peaks looking north from Mt. Davidson in 1903. The road running left to right is today's Portola Drive. Tower Market stands near the white farmhouse on the left. Midtown Terrace would be built on the southern and western slopes of Twin Peaks. Even today, many people don't know of its existence. Perhaps that's because within its boundaries, there are no shops, restaurants, or businesses, and no commercial streets. Like a suburban development, it consists entirely of single family residences, a fire station, an elementary school, and a church. The neighborhood features mid-century modern homes arranged in rows on terraced streets, surrounded by greenbelts, forests, reservoirs, and open space. In my youth, I saw Midtown Terrace as a true paradise—a place where kids could spend hours exploring thick mysterious forests, hiking to the top of Twin Peaks, or playing in quiet streets that were almost free of traffic. "Country living in the heart of San Francisco," is how I once heard it described. And as a 12-year-old, I aspired to live there some day. 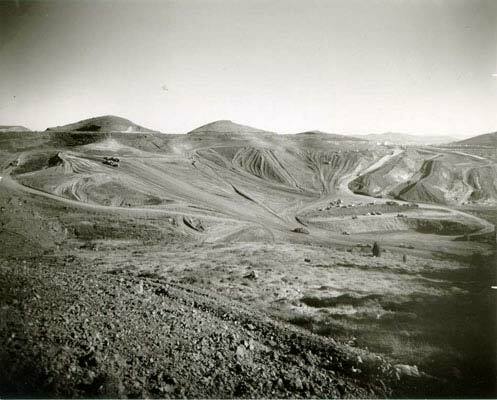 The land occupied by Midtown Terrace (approximately 150 acres) was once part of Rancho San Miguel, a large 4,400-acre parcel originally granted in 1846 to Don Jose de Jesus Noe, the first mayor of Yerba Buena (the pre-cursor to San Francisco). The land then changed hands several times, with ownership eventually being acquired by Adolph Sutro, a prominent engineer and developer and San Francisco's mayor from 1894 to 1896. 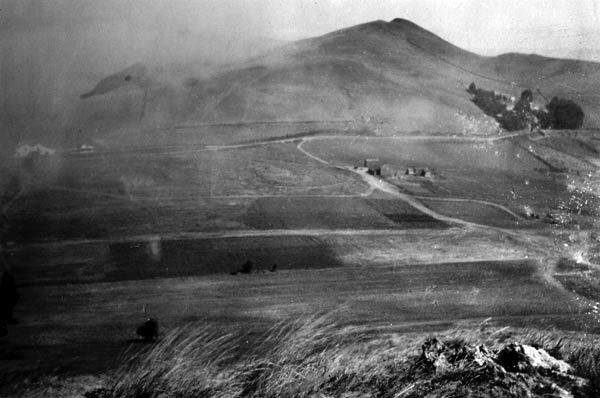 To transform its "bleak" appearance, Sutro had eucalyptus trees planted on a significant portion of his property, which eventually became Sutro Forest. After Sutro's death in 1898, family squabbles and legal battles ensued over the land. 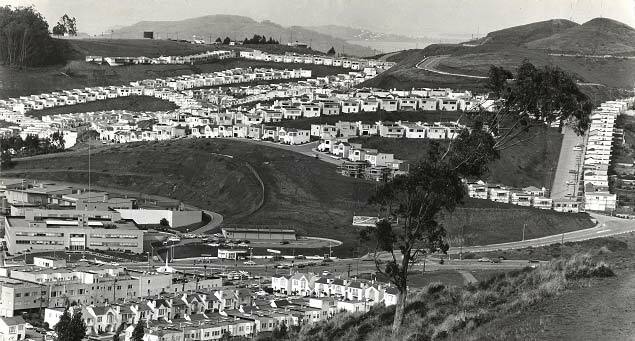 His heirs eventually sold the area to developers and the various West of Twin Peaks neighborhoods began to take shape, being built on the "City Beautiful" concept of landscaped residential parks featuring detached single family homes. 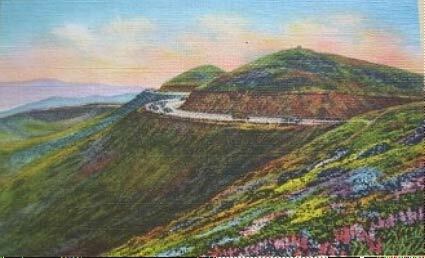 A post card from the 1920s showing the western slopes of Twin Peaks covered with wildflowers. It was on these slopes that Midtown Terrace would later be built. By today's standards of ecological preservation, it is in some ways sad to know that such beautiful landscape would eventually be paved with streets and covered with houses. But the City needed to grow, and development was considered improvement. It is fortunate that despite the pressure to build and expand, there were those individuals who had the foresight to preserve portions of the area (including Twin Peaks, Mt. Davidson, and parts of Sutro Forest) in an undeveloped state. In large measure, it is proximity to these preserved areas that gives neighborhoods such as Midtown Terrace, Forest Knolls, and Miraloma Park their unique character and beauty. 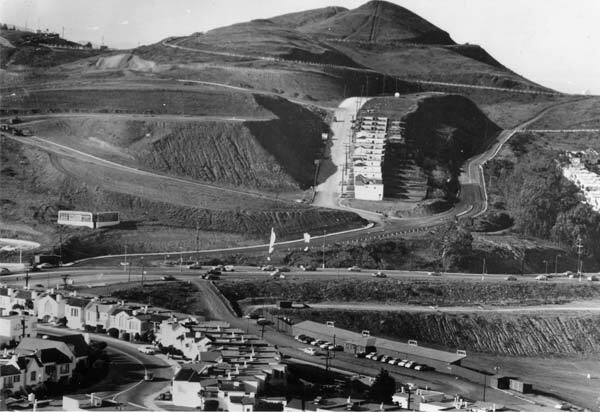 By the early 1950's, development was in the cards for the area on the western slopes of Twin Peaks. In 1953, the Standard Building Company (owned by the Gellert brothers, Carl and Fred) would begin construction of about 800 modest two- and three-bedroom single-family homes on 150 acres. The building would continue over a period of about six years. Their approach to development would follow the "City Beautiful" concepts of the neighborhoods that came earlier; emphasis was placed on blending the community in with its natural surroundings, and taking full advantage of the incredible views. The new neighborhood would be known as Midtown Terrace. 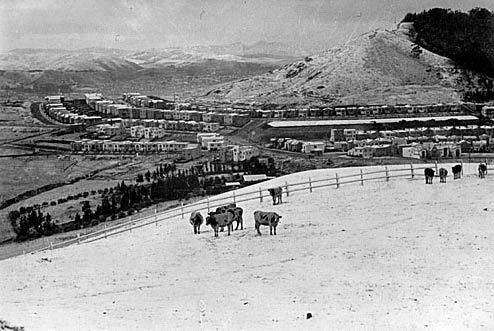 Dairy cows grazing on what is now Panorama Drive, which today winds through the Midtown Terrace neighborhood. This picture was taken on December 11, 1932, after a rare snowfall. Miraloma Park is in the distance and Mt. Davidson is on the right. "Ever hear of such San Francisco streets as Skyview, Cityview, Longview, or Knollview? It's not likely since most of them are still just names on the drafting boards of engineers and architects. Yet before long, perhaps by the end of the summer, you may be receiving invitations mailed from there for housewarming parties at the new homes of friends in "Midtown Terrace No. 3." Conceivably, if you're a view addict, you might even be throwing such a party yourself in the next year or two or three. That's the timetable for ultimate total development of San Francisco's newest subdivision-in-the-making on a spectacular site on Twin Peaks' western slopes. 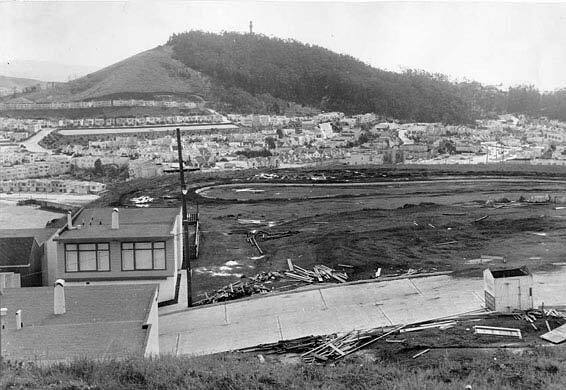 The first street in Midtown Terrace, Midcrest Drive, takes shape on the southern slope of Twin Peaks, April 13, 1953. More on the photo above: Home prices started around $13,000. The billboards in the lower left advertise the new Midtown Terrace neighborhood. The telephone poles on the street would later be removed and the utilities under-grounded throughout the neighborhood to enhance the aesthetic. The road with cars in the foreground is Portola Drive. Private enterprise has altered drastically the face of those slopes, on rolling acreage which many have considered for years part of a public institution. City planners say most folks are surprised, and some a bit chagrined, to learn how much of the whole Twin Peaks area is privately-owned, hence subject to future residential development. Along most of Twin Peaks Blvd. itself, over and around the two famous peaks, San Francisco owns only sufficient adjacent strips and sections to preserve the view for motorists and to plan its incorporation, some day, into a sweeping "green belt" to enhance the peaks' beauty and recreational potentialities. Frances J. Tillmany in front of Standard Building Company headquarters at 2222 - 19th Avenue in the 1950s. 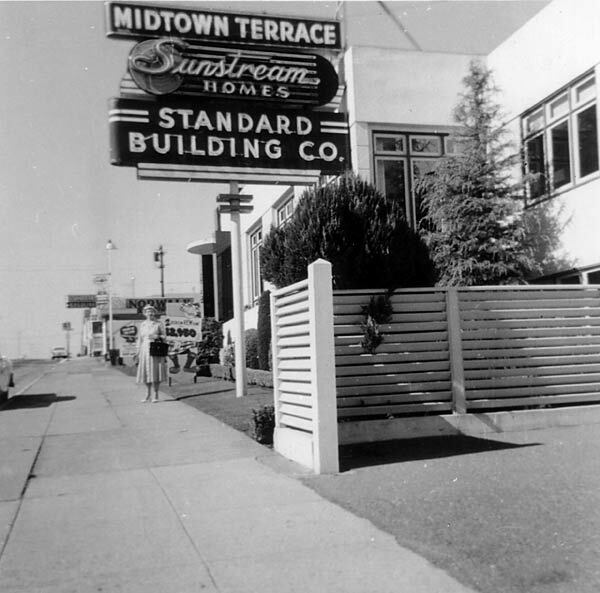 The company, run by the Gellert brothers, would advertise current subdivisions, in this case Midtown Terrace, on the sign. The 150 acres on which 800 Midtown Terrace homes eventually will be built constitutes the biggest single chunk of land [in San Francisco] to which title is held privately. Thus far Standard Building Company has erected only about 40 homes for its associated marketing corporation, Panorama Development Co. and those only on the southern and eastern slopes of the peaks, north of Portola Dr. But by summer, according to Carl Gellert, Standard's president, work should be underway on the first 100 to 150 houses on the western side. Grading for sites there is about 75% complete, with some 600,000 cubic yards of earth pushed around in the process, and subdivision plans are in the hands of city officials for approval. The western slope has been mapped into seven different levels, each designed to accommodate a new street with building lots largely confined to one side of the street, the "down" side, to cash in on the view. Curious San Franciscans stopping off to inspect the diggings have had a preview of the vistas the subdivision will boast. These will take in such landmarks as Sutro Forest, Laguna Honda Reservoir, Mt. Davidson, St. Francis Wood and Forest Hill, with the glittering Pacific for a backdrop. Mayor Robinson's big new home is an incidental part of the skyline, to the north. Looking south at Mt. Davidson and Miraloma Park, March 24, 1954. The street in the foreground is Cityview. Gellert is confident San Francisco will adjudge the finished product, three or four years hence, an attractive addition to Twin Peaks' natural assets. "It won't be an all-at-once type of subdivision," he explained. "We will be feeling our way up there, trying to offer the public the kind of a development home buyers will be proud of, at prices they can afford to pay." For the most part they will be dwellings with two and three bedrooms, priced at $13,000 to $16,000—perhaps with a few up to $20,000. All will be detached, with design emphasis concentrated on view possibilities. "Tastes of the public as reflected in the first houses offered will largely determine the style and design most acceptable," Gellert explained. What about slide possibilities, in a grading operation so extensive? Gellert and his chief construction engineer, Edward V. Schulhauser, answered almost in chorus that every precaution has been taken since the start of grading last fall to eliminate any such possibility. "From the start," said Gellert, "we've had the benefit of continuous consultation with Charles H. Lee, a soils engineer and expert on foundation development." "For our own protection, and that of the public, stability of the site has been a predominant consideration as the work has progressed." To a considerable degree, Gellert's enthusiasm about the possibilities of the new subdivision are shared by Paul Opperman, city planning director. "With careful engineering to assure slope stability, and with superior site and architectural planning, it could prove one of San Francisco's most attractive new home developments." Opperman said city agencies are "justifiably interested" in Twin Peaks because of its place in San Francisco's official Master Plan. City plans for Twin Peaks include a start this summer on reconstruction of Twin Peaks Blvd. from Clarendon Ave. to the finished section 800 feet north of Portola Dr. This will include widening, re-alignment, and resurfacing of the road, a $67,000 job already under contract. Clarendon Ave. is also scheduled for widening, from Laguna Honda Blvd. on up the hill, and a start is contemplated this year for improvement of Portola Dr., from Woodside to Corbett Ave., into a straightened, six-lane divided highway. The Twin Peaks "green belt" envisioned by park-recreation officials would extend all the way from Glen Canyon, across Portola, up over the peaks and connecting by means of landscaping and hiking trails with areas north of Clarendon Ave.
"Some day, perhaps," in Opperman's words, "public and private improvements will make possible the full realization of Twin Peaks' enormous potentialities." SF Youth Guidance Center building in lower left. Twin Peaks on right, February 1959. 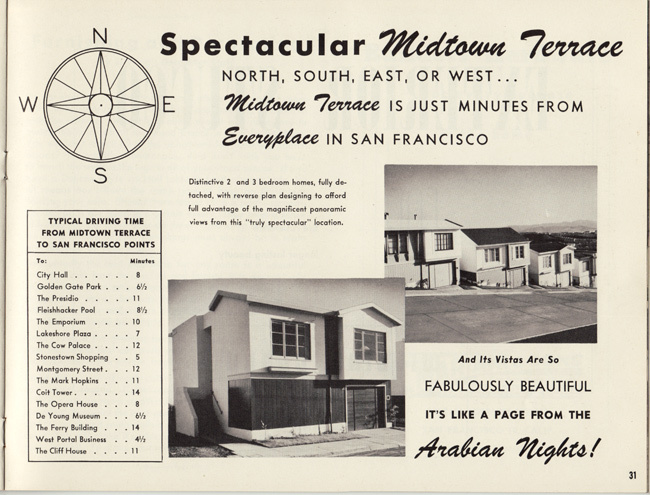 Midtown Terrace, seen in situ west of Twin Peaks, c. 1960. 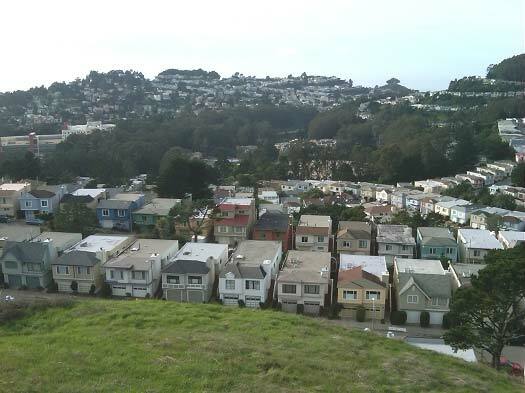 Looking west at a portion of the neighborhood as seen from Twin Peaks, December 27, 2010. The street in the foreground is Aqua Vista Drive. Golden Gate Heights is the tree-topped hill in the distance at upper right. Forest Hill is at upper left. 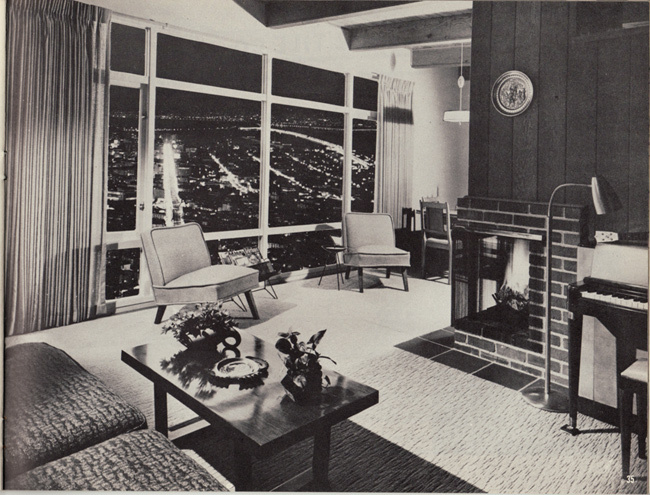 Ad and photo for Midtown Terrace from Sunstream Homes sales brochure, 1950s. Back in March of 1954, a story in The News predicted many San Franciscans within a few years would know intimately a variety of such new street names as Skyview, Cityview, Longview, and Knollview. It was a safe enough prediction, since the story described how Standard Building Co. would begin creation of a big new residential development on the western slopes of Twin Peaks. 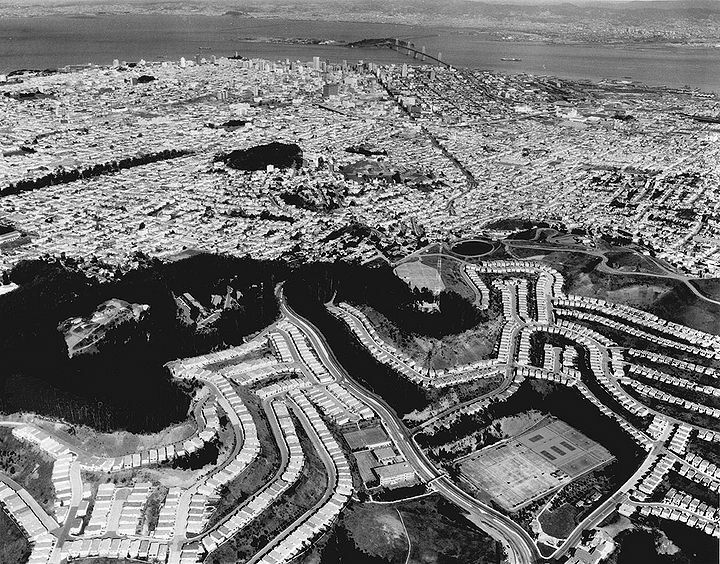 Of all the new residential projects then planned for San Francisco, it was the biggest. By now, 900 of the 1000 homes Standard planned in the area have been completed. And most have been sold almost as quickly as they were finished. Most have gone for $17,200 to $22,950 and a comparatively few with "super" qualities for up to $29,500. The streets are familiar indeed now to the new residents, their children, and hundreds of tradesmen serving the families and prospective home-buyers inspecting houses still a-building. A Muni bus loops through the area on weekdays (and the Midtown Terrace Home Owners Assn. is hoping for Sunday and holiday service, too); ground has been set aside for a new elementary school; and the Recreation-Park Dept. is budgeting $160,000 for a playground atop the covered Sutro Reservoir. Just as the builders invite inspection of new view homes "in the heart of San Francisco", the [homeowners'] association is out to make Midtown "a garden spot in the heart of the city", according to its president Mrs. Theodore Jewell of 435 Panorama Way. Admittedly an "eager beaver" in this and other aims, she explained with enthusiasm how the City Planning Commission responded to the association's request for help in planning an extensive landscaping project. "They assigned Miss Ruth Jaffe (an associate city planner and landscape architect) and she worked out a whole area plan for us. We're having a meeting on March 3 to request membership approval to go ahead. It would cost about $14,000 altogether, in three stages, and we already have a good sum on hand for a start. The first phase would be trees and taller growth planted between the street levels (there are seven such levels from the bottom of Midtown Terrace proper). The second would be shrubs and medium growth; the third, ground cover, such as ivy and ice plant." "Altogether, a garden spot in the heart of the city." Billboard (behind the tree) advertises Midtown Terrace as being "Minutes to Anywhere." 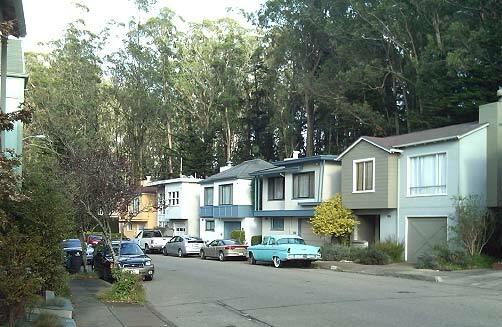 The neighborhood is now well over 50 years old (new by San Francisco's standards), yet it remains a charming and unique place, as its original developers would have intended. While a few of the houses are a little worse for wear, most have been well maintained, reflecting pride of ownership. It is still a solidly middle-class San Francisco neighborhood attracting young families, working couples, and professional single people both straight and gay. Some of the residents, including my next-door neighbor, are original owners having bought their homes when they were brand new in the mid 1950s. The Midtown Terrace Home Owners' Association is still an active organization, and every homeowner in the neighborhood is a member. The association's bylaws that were developed in 1956 are still in effect and contain rules intended to preserve the charm and character of the neighborhood, including the unique greenbelts running through it. 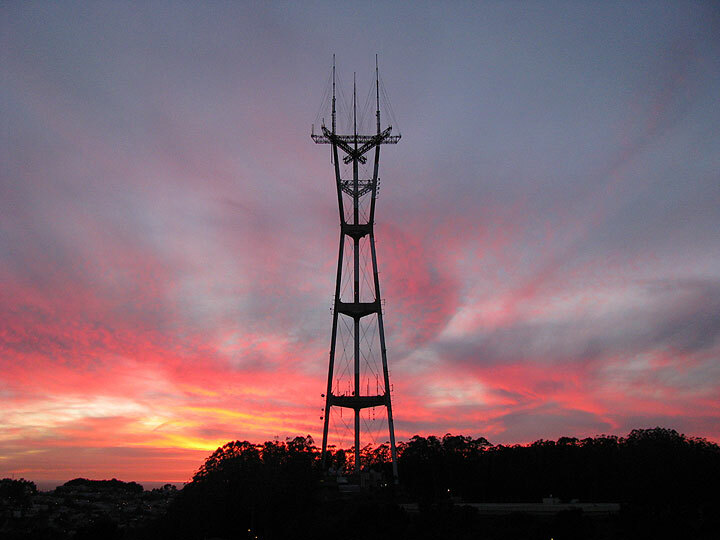 Since 1974, the neighborhood has been home to the 980 foot-tall Sutro Tower used as a transmitter by Bay Area television stations and the State's Emergency Broadcasting System. The tower has long stirred controversy among neighborhood residents over its unsightliness, questions about its structural integrity, and concerns over possible health effects from radio frequency (RF) radiation that it emits. Though visually obtrusive, Sutro Tower is now a prominent San Francisco landmark that can be seen from virtually anywhere in the Bay Area and reportedly even as far away as the Sierra Nevada Range on a clear day. 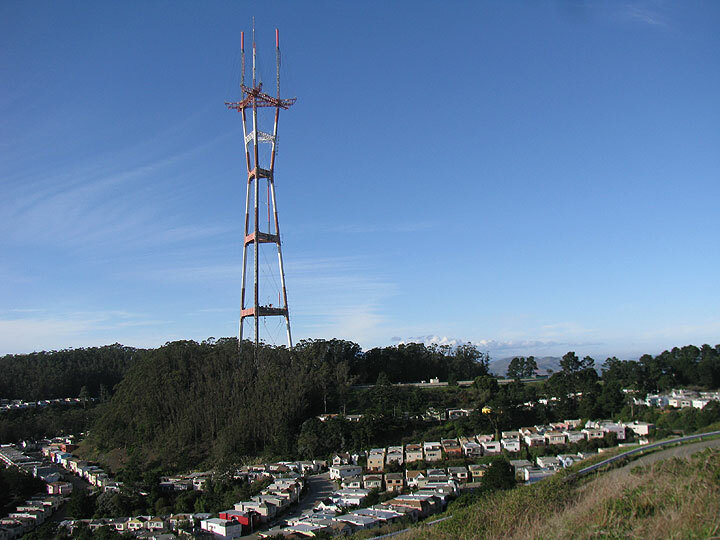 Sutro Tower Incorporated (STI), the tower's owner and operator, has assured residents that the structure meets earthquake standards. 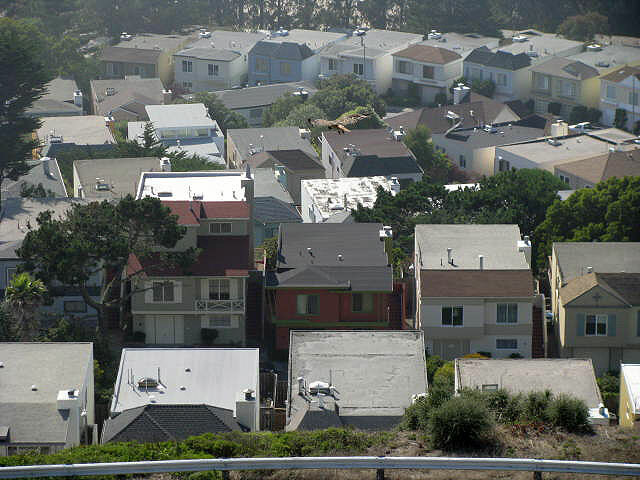 Sutro Tower sits over Midtown Terrace, as seen from Twin Peaks, December 2010. Although RF remains a concern to some, the tower's operators conduct periodic measurements in and around Midtown Terrace to ensure compliance with the Federal Communications Commission's (FCC) radio frequency exposure guidelines. All readings are publicly available and have shown RF exposure levels to be orders of magnitude below the FCC's guidelines. (No scientific study has yet connected RF exposures of the type experienced in the neighborhood to any adverse health effects. Nonetheless, STI contributes $3000 per year to the Midtown Terrace Home Owners Association). Sutro Tower at sunset, February 2008, from Twin Peaks. As City planners imagined over half a century ago, the natural areas adjacent to the neighborhood, including Twin Peaks and Sutro Forest, have been preserved and maintained for the public to enjoy. Twin Peaks, with its spectacular 360 degree views of the Bay Area and the Pacific Ocean, is habitat to rare plants and an endangered species of butterfly found nowhere else in the world. It's also home to wildlife including skunks, raccoons, and even coyotes. Redtail Hawk seeks its dinner at edge of Twin Peaks, Midtown Terrace in background. Sutro Forest (though consisting predominantly of non-native eucalyptus trees planted by Adolph Sutro well over a century ago) is a lush, green enchanted woodland on the northern side of the neighborhood. Owned and maintained as a nature preserve by UCSF, it features miles of public walking and mountain biking paths that allow you to forget you're in the middle of a densely populated city. These beautiful places are within walking distance of anywhere in the Midtown Terrace neighborhood. It's true that there are other San Francisco neighborhoods with more history, larger houses, and more interesting architecture than Midtown Terrace. But everything considered: the beautiful wild surroundings, clean quiet streets, quaint well-maintained mid-century styled homes, convenient location, and small town atmosphere make this neighborhood one of the most unique in the city. It is truly "Country living in the heart of San Francisco." A wooded section of Dellbrook Avenue in Midtown Terrace.